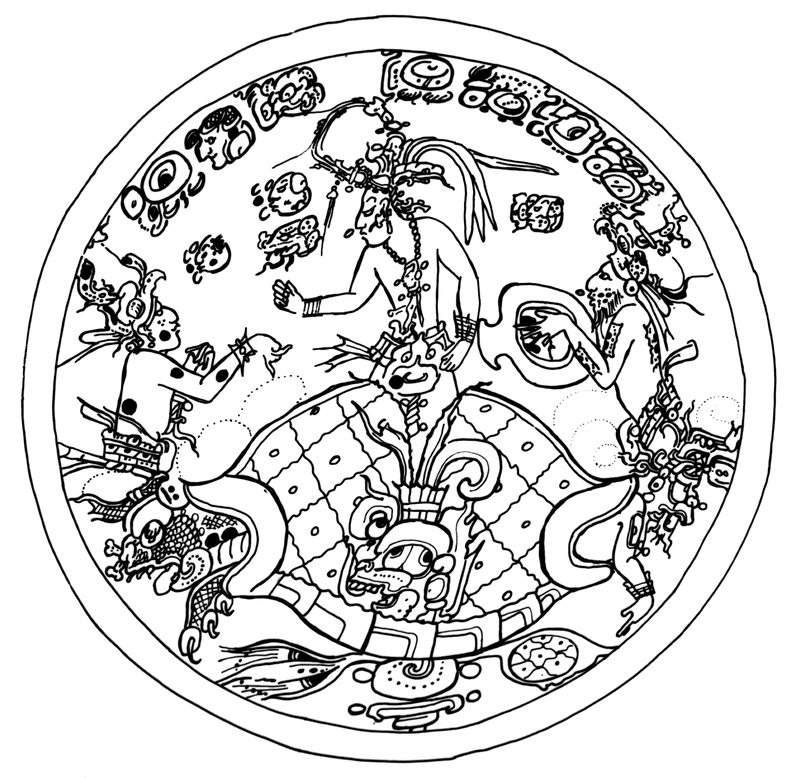 Image from the “Dresden” Codex, an original Maya book. Some humans were not left totally in the dark though. They were given an ilb’al, a “seeing instrument,” namely, the Popol Wuj. With this “book of the people” and the sacred calendar it implies, they could foresee the movements of the planets, when it would rain, when there would be famine, war, death, etc. It guided their lives through time and effectively became for them a sophisticated system for the navigation of time. It was to them what GPS has become to modern people — they didn’t “go anywhere” without consulting it. It guided them in every aspect of life: when to plant, when to harvest, when to marry, when to conceive, when to build, when to travel. Then came another people from far away who were more concerned with space and had developed extraordinarily sophisticated systems for its navigation. The space people were the people of horses, roads, boats, compasses, maps and wheels. By contrast, the only wheel used by the time people formed a part of their cyclical calendar. These space people used their advanced technology to travel a great distance and conquer the time people, and then they destroyed nearly all of the books of the time people. Only four original books (codices) survived this mammoth destruction. Although stripped of their libraries and archives, the time people secretly retained the essence of their learning. They kept it alive through strong oral traditions, and before that first conquered generation passed, some of them even learned the alphabetic writing system of the space people. They wrote down in alphabetic script the essential content of their “seeing instrument,” the Popol Wuj, and they kept it a holy secret. 150 years later, one of the space people, a Dominican priest, became fascinated by the ideas and legacy of the time people. He learned their languages, and gained the confidence of the time people to such a degree that he was not only permitted to see this sacred text, but he also transcribed and translated it into what is now the only known surviving manuscript of the Popol Wuj. 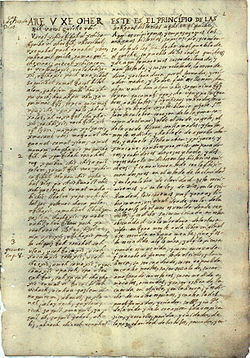 The original manuscript de Father Francisco Ximénez now at the Newberry Library in Chicago. Another 150 years passed and, upon the closing of all monasteries in Guatemala, that manuscript ended up in a university library in the capital city. There a visiting scholar of the space people (from Austria) chanced upon it, recognized its value, and decided to steal it from the library. During the years that followed, this manuscript made a variety of appearances around Europe, where many of the space people now took great interest in it. It finally ended up in a library in the “place of wild onions,” also known as Chicago, where it continues to be archived to this day. So the space people conquered the time people and destroyed their books, but the time people learned a trick from the space people (alphabetic script) and secretly salvaged an essential component of their temporal navigational system in the text of the Popol Wuj. Then a sympathetic space man copies down and translates what has become the only surviving manuscript of the Popol Wuj. Another space man comes and steals the manuscript, trades it among the space people, who take a liking to it and start to print copies. This rather complex story, filled with both tragedy and intrigue, depicts two different aspects of the original clairvoyance and the convoluted karmic knots between the peoples of time and space. It also explains how it came to be that we at Escuela Caracol, located in a region that is struggling to regain its literacy, came into the possession of printed copies of the Popol Wuj. Perhaps it also hints at why Escuela Caracol, which seeks to bring the time and space people together to explore their collective destiny, has recently decided to undertake a study of the Popol Wuj together among the faculty. And perhaps it is fitting with the strange irony of this history that after 500 years this sacred text is making its way through the space people to a new generation of time people for their first reading ever. For me, it is a great honor and a privilege to read the Popol Wuj with the local indigenous teachers of Escuela Caracol. Written in the early hours of 9 Ajmak, the day of forgiveness and redemption in the sacred Mayan calendar.